First, I'd like to say that I enjoy thrift shopping, and I do it semi-regularly. A friend of mine has just recently launched her own blog, MichiHighlights.com, and asked for my participation in a little "challenge" of sorts. I was super excited when Michi challenged me to a $20 thrift store shopping challenge to put my thrifting skills to the test. Now, in a perfect world, I would be showing all of you some fabulous, vintage-y finds...but a las, I only went to the Goodwill and Goodwill isn't really the kind of place that just overflows with vintage goods like it use to. For the most part you have to go to "vintage boutiques" for the good stuff and it don't cost 20 bucks...at least not here in Atlanta. So when shopping at Goodwill, I am usually looking for nice "closet fillers", i.e. everyday clothes. I tend to keep my eyes open to name brands that I recognize. If I plan to give an item a "second wind", I like to know that it's more than likely built to last. Now with all of that said, I managed to snag four items with my dub piece. I specifically decided to go with an autumn/fall theme since it will be upon us before we know it. 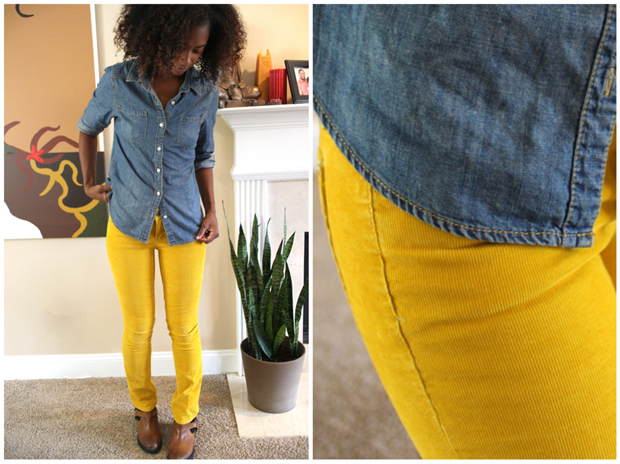 First, I found a nice little pair of Gap corduroy pants in the most amazing mustard color. They are in excellent condition, but they are one size smaller than my usual pant size. I decided to try them on, and they worked! Now if you want to see the other items I snagged for a grand total of 20 bucks (give or take because of sales tax. lol), check out both of our posts HERE. you just got soo many cool points in my book for the title of this post! haha. i love it. and you're right, the vintage boutiques here do come with a price tag. however, there is this one spot in downtown college park that i like to go to and i can find really nicely priced jewelry from one vendor in particular. oh, and the pants are great! love them! College Park? Hmmm...I may have to "hunt" around for that place! I love vintage jewelry actually. I also think jewelry is one of the easiest ways to start off with, when trying to incorporate vintage into a wardrobe! I love thrifting too - those yellow cords are fab! any GT lady would kill for those! haha You're right about the color! Thanks! You should! I always find SOMETHING, whether clothes, jewelry, or something for my house! I need those pants in my life. My daughter loves thirft shopping cause she can cut, dye or do whatever she wants with her thirft clothes.